So many badges, so little time! That seems to be the moral of the story at the moment as I struggle to keep up... Anyway this is a really good set of 7 beers, through 9 badges. As usual let me know any thoughts on any of these you have had. Pale as the Moon (Level 34) was the first badge that I missed. The beer was Panhead's Quickchange APA, incidentally I met the brewer the other day - top bloke! That said this beer is a really nice American Pale Ale with plenty of tropical fruit flavours. 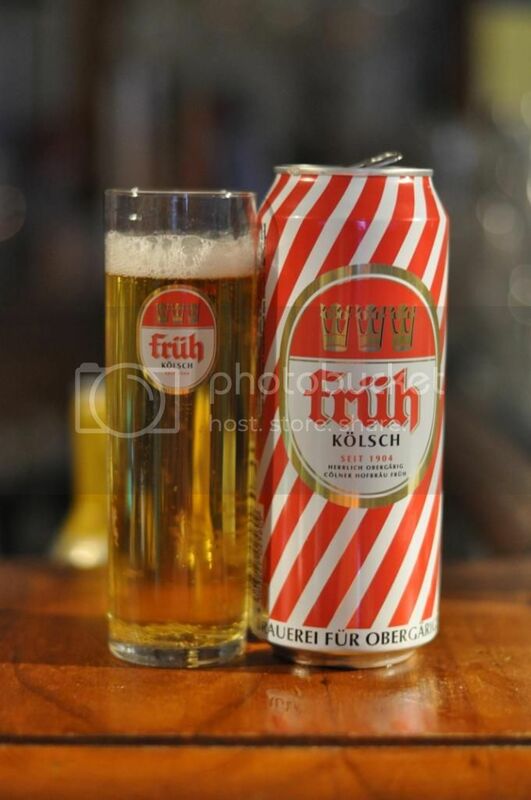 The Früh Kölsch can, pictured right, is so cool to look at! The beer is also a spectacular example of Cologne's (Köln's) specialty beer. Das Boot (Level 8), the badge for drinking German beers, was why we're talking about it. I'm surprised I haven't review this in full before, I will aim to fix that soon. In short it's a good Kölsch to try if you haven't had one before. I posted yesterday about my indifferent experiences at Hargreaves Hill Brewing yesterday. The beer that I thought was the worst of the bunch that day was the Hargreaves Hill Pilsner, funny it would be that beer that earns a badge. The badge was Crisp As Day (Level 10) and the beer was a little underwhelming. Probably avoid this, it was the worst beer I tried at the brewery, some of their other beers are worth a try. Whilst rummaging through my fridge the other day I found a BrewDog Hoppy Christmas. Somewhat strangely after I checked it in I ended up with the Winter Wonderland (Level 3), a badge I thought had to have the word "winter" in the name or style. Maybe "Christmas" is now close enough to "winter"... Anyway despite now having a bit of age on it this is a very nice IPA, full of grapefruit and citrus flavours. If you see it in a Dan's clearance bin, grab it! As always a Bear Club beer managed to work it's way into the Untappd Catchup; this time it was Sixpoint's Otis. It actually earned two badges Heavy Weight (Level 26) and Land of the Free (Level 30). It's a wonderfully creamy Oatmeal Stout and one that I can't recommend highly enough, especially if you've never had an Oatmeal Stout before! Another beer I had last Sunday was 2 Birds' new IPA; Wolf of the West. I've been meaning to try this for a few weeks but have kept missing it around the traps. Of all the places I found it at The Public Brewery, new Out of Office review to follow shortly. The beer was brilliantly dry with plenty of citrus, but was unfortunately a little lacking in bitterness... Still in the blistering sun at The Public Brewery it was exactly the sort of beer I wanted! I very nearly forgot about the Founders Year-Round badge! Luckily on Monday I remembered and had a Founders Pale Ale in the fridge. It's a really solid American Pale and one I'd recommend. It also surprisingly earned the Beer City, USA badge - a badge for drinking beers from two different breweries in Grand Rapids. I'm completely stumped what the other beer may have been... Oh well I'll take it! I'm going to try really hard to write full reviews for my next 5 Untappd badges! These reviews are becoming ridiculous! Anyway, there were some really good beers in this little review. As usual let me know your thoughts on any of them or if you have any suggestions for beers I should review. Keep your eyes out for new reviews soon!